The Bob Martin Flea Bomb builds on years of experience to give you a convenient, powerful and easy flea control system for your home. Each bomb treats a room of up to 36m3 and has immediate knock-down effect, killing fleas immediately. 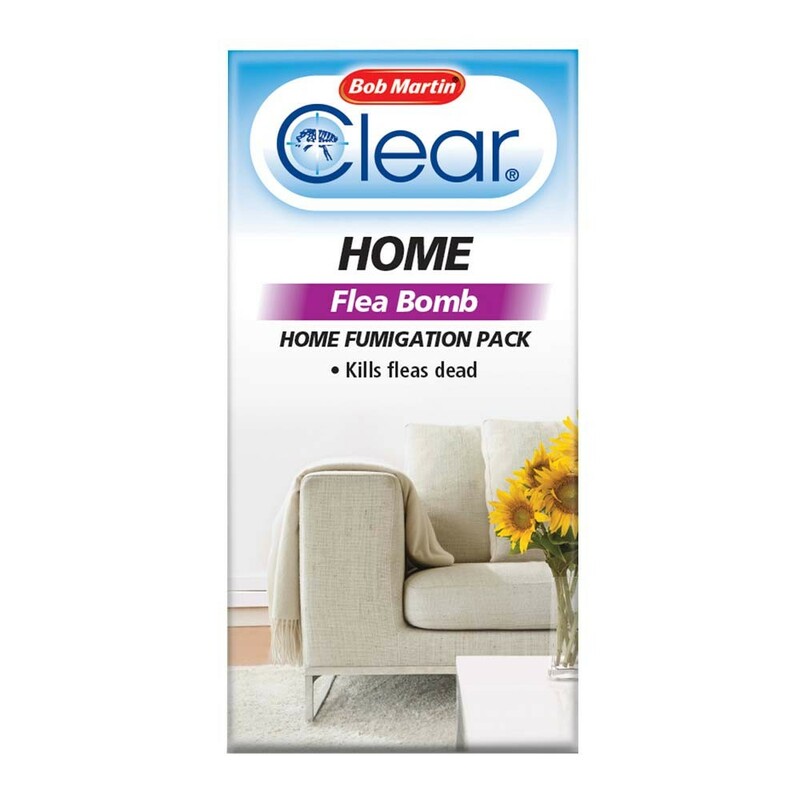 Warm rooms can be a hotbed for flea infestation and the Bob Martin Flea Bomb is ideal for controlling and managing this long-term. 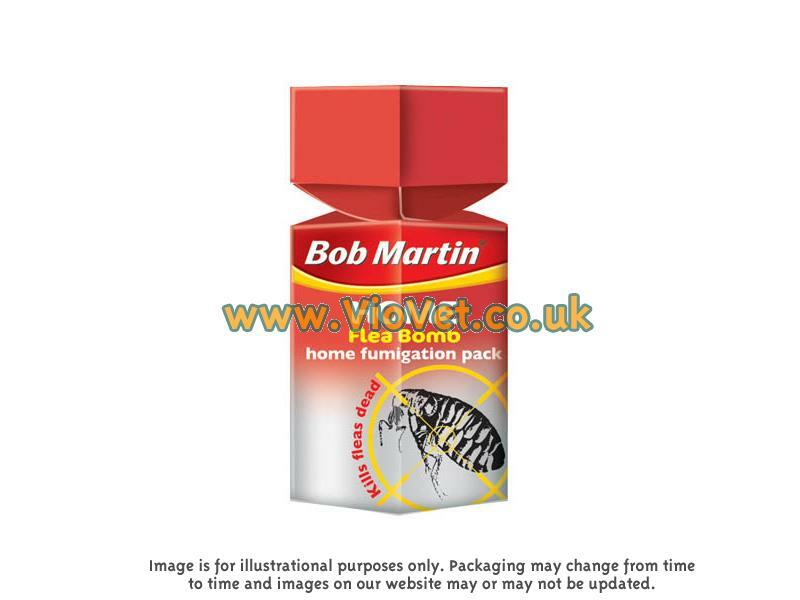 100% safe for use around animals, the Bob Martin Flea Bomb comes highly recommended. Close all doors and windows and exclude all pets. Set off the flea bomb and leave the area for 2 hours. After a 2 hour period, enter the area and open windows to allow free ventilation for 30 minutes. After that, it is acceptable to close windows and doors and allow full access for people and animals. Below are some recent questions we've received regarding Bob Martin Clear Flea Bomb, including answers from our team. I have a budgie that is free to fly around the lounge. She refuses to be put in her cage. If i set a flea bomb up stairs will iy affect her downstairs even if i keep the lounge door shut? Also do i need to mobe the fish up stairs, or can i just cover them. And if so for how long? You should cover the fish for as long as the product is in the air. Once it has all settled out and you ventilate the area (doors and windows open) then it should be OK for the fish. Moving them from the area might be better though if it is possible. Birds however are very sensitive to anything in the air and personally I would not use this product in the same room as a free-flying bird. One way or another I recommend that you should organise moving the budgie out before treatment. I would not feel comfortable using this, although it theoretically should be safe for reptiles if you are careful. The ingredient (pyrethrum) is often used to treat reptiles for external parasites and for most reptiles it is very safe as long as it is not overdosed. There is some suspicion that some species of snake are more sensitive to toxic effects that others, but this is not clear. Certainly it is known to be toxic to fish (and cats). If you can seal off the vivaria while the product is in the air, then ventilate the room well before allowing air circulation into the vivaria then it should be safe. Does the bomb work for cat fleas? This product is labelled 'suitable for dogs' does it work on cat fleas too? This works equally well on cat fleas and all other types of flea. If you follow the instructions, it will work for them all. Can you tell me the active ingredients of the flea bomb? The active ingredients are: Permethrin 0.50 w/w, Bioallethrin 0.10% w/w, S-methoprene 0.05%w/w. how long does the kill effect last for eg 12 months?? This product is meant to have an effect for up to four weeks. There are other products/flea sprays available on our website that last up to twelve months.